While Australia possesses a large array of talented farriers and blacksmiths, it is somewhat isolated from the rest of the world. A handful of dedicated farriers travel abroad to study in England or America to get a different perspective and improve their skills. It is a real treat when an international educator can come to Australia and share his or her knowledge with a larger group of people. After a trip to Australia’s Great Barrier Reef, Dave Duckett started his educational tour with two clinics sponsored by Stockmans Supplies of Queensland and Mustad Australia. Approximately 150 farriers attended these two clinics along with a handful of interested veterinarians. One clinic was held at the University of Queensland, Gatton and the second at Hawkesbury TAFE, site of the farrier school, near Sydney in New South Wales. Click on the red "play" arrow at the top to start the sound file report from ABC Radio in Australia. Dave discussed the rationale behind “Duckett’s Dot” and “Duckett’s Bridge” in a lecture presentation and went on to explain how those concepts can be applied to both healthy and diseased feet. The afternoon portion of Dave’s clinics focused on anatomy with a distal limb dissection. Originally from England, Dave has lived in the United States for the last 30 years. He is world renowned for his talent as a farrier, with multiple world and national titles, yet he focused primarily on how fundamental concepts can contribute to the long-term soundness of the horse. 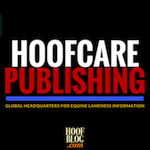 This created an excellent forum for both veterinarians and farriers to discuss how Dave’s concepts could be applied to everyday cases and bridge the two groups of professionals. The week finished up with a horseshoeing contest sponsored by the Equine Podiatry and Lameness Centre and hosted by the Professional Farriers’ Association of New South Wales. The contest was an excellent opportunity for competitors to demonstrate their work and get feedback from Dave. While Dave commented on the forging skills of the competitors, he brought every job back to the fundamental concepts he discussed in his lectures. He was very kind and approachable and went out of his way to help apprentices as much as seasoned competitors. I had the honor of scribing for Dave for a part of the competition and he was very clear in that he did not want any competitor to be last or feel discouraged if they did not perform as well as they would have liked. He wanted every competitor to walk away having learned something and to be inspired to improve their skill level. I was very impressed by Dave’s ability to connect with everyone he encountered and how he took extra time to tailor his explanations so everyone could understand. We were very lucky to have Dave Duckett “Downunder” and would like to express our sincere thanks to him for making the journey. Thanks to Ufocus Photographic Services for photographing the event; the photos you see here were provided by Ufocus. About the author: Guest contributor Elizabeth (Betsy) Lordan, DVM is a graduate of Boston University and Colorado State University College of Veterinary Medicine (2013). 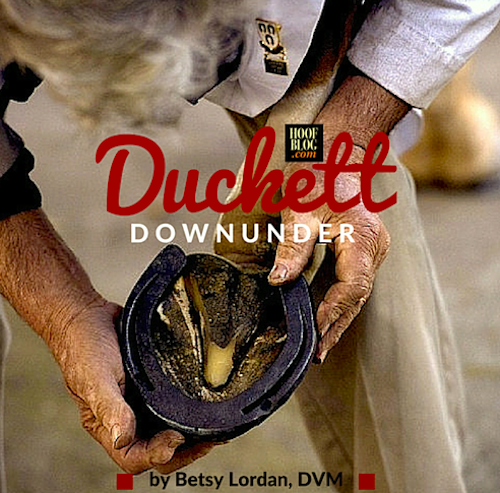 Betsy joined The Equine Podiatry and Lameness Centre in New South Wales, Australia in 2014, but still calls Gloucester, Massachusetts home.